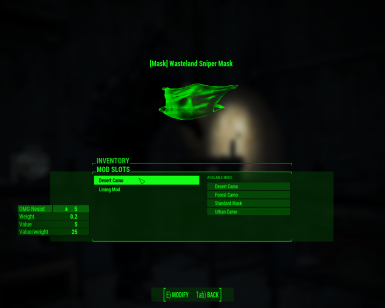 Changes and adds new stuff to the mod Wasteland Sniper by Hothtrooper44. Hothtrooper44﻿ for his awesome mod. Changed armor rating from 112 to 24. Changed suit's fire resistance to poison resistance. Added Anchorage (Snow) camo to suit, hood and mask. -Adds Linings (to the suit, hood and mask). -Adds Add-Ons (to the suit). -Adds Head Add-Ons (To the hood). -Adds the ability to add Ballistic Weave to it. 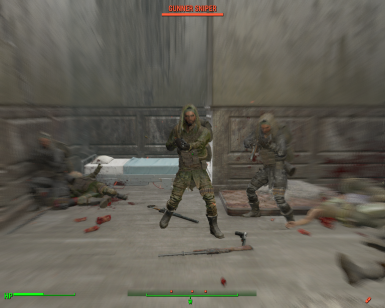 -You can now wear individual pieces of armor over the arms and legs. -Instead of the random Charisma boost, each part now improves your sneakiness, and in the case of the suit, it also improves your carrying capacity (Because of all the pouches it has). -The mask now grants a small poison resistance. -The suit and hood grant you a bit of poison resistance instead of energy resistance. -Armor rating decreased from 112 to 24 so it balances better with other armors. -Just go to the armor workbench, and switch under the category "Sniper (Hood/Suit/Mask) Camo" and craft whichever you like. -Not on the Gunner Sniper LLs so it doesn't clash with the enviroment. 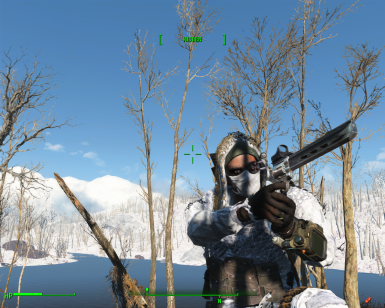 -Great for people that use winter mods like "FROST" or "Fallout 4 Seasons - Winter". 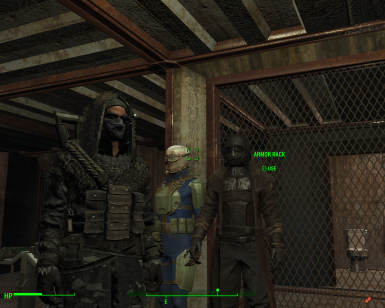 - They wear exclusively the Wasteland Sniper armour sets, with all the different variations of camo. -They use exclusively sniper weapons. - They are the same rank as Gunner Liutenants, but look different (Beard, longer hair, tactical face paint). Should spawn at the same rate as the former. 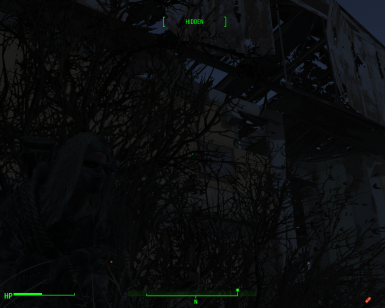 -They have a 50/50 chance of spawning with a Wasteland Sniper Mask (That matchs the rest of their camo). -May spawn with cool looking sunglasses. Adds variations of the camos to the mask, so you can now match with your armor. -No longer you have to use the default green mask that clashes with the Desert or Urban camos. 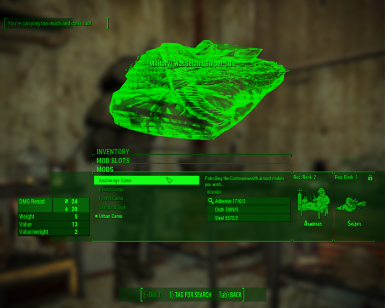 Customize it as you want in the Armor Workbench. Moves the crafting recipes to the Armorsmith Workbench. -They can be found under "OUTFITS-GUNNERS". Barney Rook wears Wasteland Sniper armor now. -It really adds to the full crazed sniper look. If installing manually, drop the contents of the file in your Data folder and overwrite when prompted. 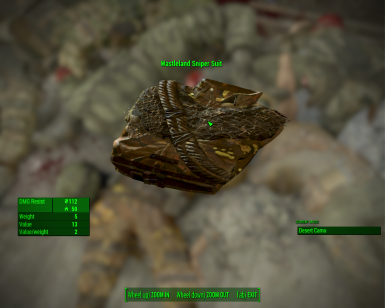 Compatible with everything that doesn't modify the Wasteland Sniper mod. Hothtrooper44 for his awesome mod. -Desaturate some textures so they blend better with the enviroment. -Make the Desert Camo Hood and Suit color pallettes merge better. Some gunners were harmed during the testing phase of this mod. Flowers will be sent to their families.